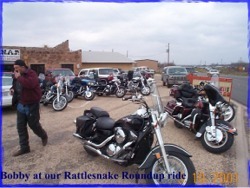 In the late 70’s I had an opportunity to fly to the Rattlesnake roundup with my cousin Dan. The weather moved in and didn’t allow us to fly the small, chartered plane we had prepared for. Oh well, things happen. Since then, I’d known about the roundup in Sweetwater, TX, but I had never made the trip. Bobby had called one day in February of 2001 and mentioned going to the roundup. He said that several others were going from various motorcycle groups in Dallas, and he was thinking about going. Joy and I decided to attend with he and Pam, so we decided to make the trip alone. We departed on early Saturday morning about 6:45 in March. It was forecast to be in the 60’s here and close to 70 in Sweetwater. I don’t believe we got close to the forecast and it made for a tough trip. We rode hard only stopping for fuel. We took the scenic route that would include a Breakfast stop at Mattie’s in Decatur. Weaving through Perrin and Albany enroute to Sweetwater made it nice, but the weather kept it from being enjoyable. The roundup was much larger than I thought. We were lucky to get a close parking spot, mostly due to our two wheel carriers. The walk to the Rattlesnake coliseum was lined with vendors and chili cookers. The “people watching” was good, but I could imagine how improved it would have been with some warmer temperatures? We could hardly get by the food vendors; we had to do some sampling along the way. Bobby, Pam and I decided to experience the snake pits of the coliseum while Joy chose to stay safely outdoors (seems backward) next to a heat emitting turkey leg cooker. The snake pits were too impressive, although I couldn’t get close enough in the shoulder-to-shoulder coliseum.It was definitely a popular place. The smell over in the corner where they were processing the snakes was a little more than most could take, including myself. I didn’t stay long and didn’t bother eating the samples, although Bobby couldn’t resist. Bobby did comment on the results, but I can’t print his reaction. Bottom line, he doesn’t recommend it. We all tried some of the carnival-like food outdoors and enjoyed the flavor. We probably wouldn’t have to go back to see the snakes though. Our trip back was relatively uneventful, but the cold was affecting us more and more. We chose to come back on 180 to Palo Pinto and then back up through Bridgeport toward Prosper. I’m glad we made the trip, but we won’t be in a hurry to go back.